Living in Beijing - ACShare.net - Sharing about how to live in China, what is the most important tips? In Chinese luna Canlendar, the last day of the "Year" is called "New Year's Eve." It is connected with the end of the new year, which is called "the end of the year, the connection of the next year," is the eve of the new year, is the important time junction of the old and new. In the hearts of Chinese people, it has special significance. On the most important day of the year, the wandering and far-away wanderers are also rushing home to reunite with their families. They are retired in the sound of firecrackers, and the fireworks are full of spring. Preparation for the Spring Festival should be completed today, the day before New Year's Eve. Worshipping ancestors is also a major event on this day, by which people express their gratitude and yearning for their ancestors during the important festival. In addition to preparing for the various food and clothing in the festival, there is also an extremely important activity, "Going to the grave to ancestors." The worship of ancestors has a long history in China. Death is not only an important symbol of filial piety, but also a virtue of respecting the elderly and respecting the elderly. Therefore, every festival, people must pay tribute to the ancestors. This is not only a kind of comfort to the ancestors, but also the gratitude and thoughts of future generations. The folk song said: "28th December in Chinese Luna Calendar, prepare the Chinese cake and paste paper-cutting on the windows." In old days, people need prepare the New Year food in advance. Chinese cake is good for keep in the kitchen during New Year festival and another reason is people will not use fire to cook food in the first 5 days of New Year. Chinese cake is good food to eat that time. The winner of Beijing is not too cold, in day time, the temperature can reach to 5 degree. IWeather here is good for Ski here. People who are living in Beijing are like winter sport, such as ski, skate, etc. Here are Top 5 ski resort in Beijing. One of the largest and most beautiful resorts around Beijing, going to this ski resort is also a one-of-a-kind trip. Sightseeing of different parts of the Great Wall of China, Chateau Changyu AFIP Global Beijing, and Chunhuiyuan Hotspring Resort, are several tourist destinations that you would pass by going to this ski resort. This ski village is mainly marketed for the young skiers to enjoy. 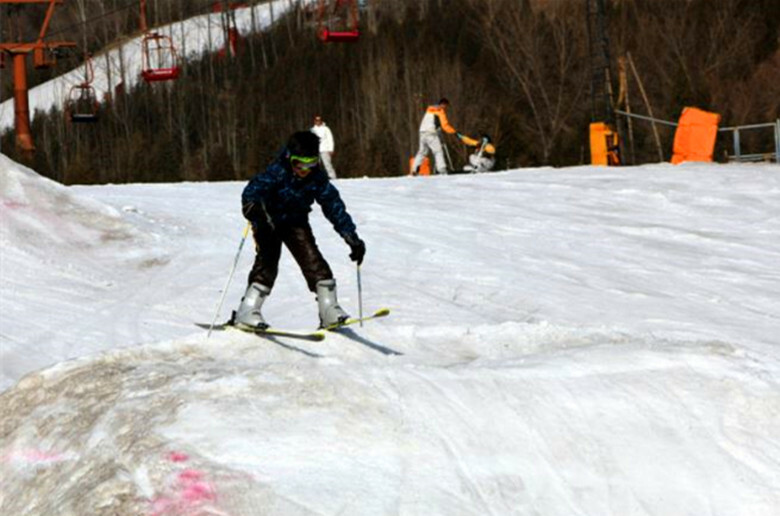 It boasts a total of trails for beginners, intermediate, and advanced skiers. It is also famous for the Off Piste or a tree run, and a seasonal toboggan run which is 1318 meters long and was imported from Germany. It is also preferred by a lot of skiers because of the famous Nanshan Mellow Park, which is the first advanced train in China. This ski resort has snowsuits and ski rentals, as well as snowboarding equipment. They also offer skiing and snowboarding lessons for groups and individuals. Shijinglong Ski Resort is the very first ever ski resort built around Beijing. It is loved and frequented by loyal skiers, and is known to be one of the most beautiful ski resorts in the city. Its location is 80km north of Beijing city center, making the destination not so hard to go to. The slopes of this resort offer a different skiing experience as skiers face the sun while skiing down the slopes. There are different 6 ski trails, and one advanced trail with 1000 meters run and a drop of 300 meters, two intermediate trails, each is 800 meters long with a drop of 135 meters, and 3 beginners trail. Promises to be the most beautiful ski resort in Beijing, this ski resort is surrounded by the Great Wall on its three sides. It has 7 ski trails, 1 expert trail, 3 intermediate trails, and 4 beginners trail. Snowboarding can also be done at this resort. There are coaches available by the hour for both skiing and snowboarding for all ages. Located on the south slopes of Jundushan Mountain, this ski resort is very near the Ming Tombs, Juyongguan Great Wall and Badaling Great Wall, a hot spring and a spa resort. This ski resort is known for leisure skiing and is popular with tourists due to its proximity to other ski resorts. It has 5 major ski trails, two beginners trail with 380 meters long run, two intermediate trails which are 530 meters and 380 meters run, and one advanced trail which is 1,200 meters long. It also has a ski school where anyone can learn ski tricks. The first and only indoor ski resort in Beijing. This ski resort has a 260-meter long run and a 150-meter bunny slope, which are both perfect for beginners and first-timers.